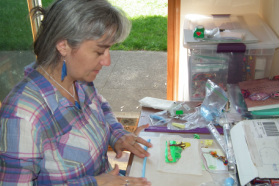 My creations are handmade with Colorful Polymer clay to create Accessories, Art and Jewelry. My process is either sculpting forms with my hands and the clay, using caning technique to create clay image, or "clay painting" for Wall Art. Mixing the techniques "sculpting" "clay Painting" and "Canes" to create Unique Art is my challenge. Each of my creation are unique and entirely handmade by me, with Premo or Fimo Polymer Clay. I'm originally from France, leaving in San Francisco Bay Area since 2001. I'm happy to share my creations with you. Opening of Tchoupuce, my first business and Website. I discover Polymer clay at my local craft store, start playing with it. I'm making cute creations for my daughters and their friends, and sell them at fairs. I love the color possibilities with this fun material. I realized making bigger "clay painting" piece is something I really like for the creative work it gives me, for the fun to think about it, to create it, for myself accomplishment, and for the pleasure of making Unique Art piece. I also like making more and more canes, it's fun to assemble colors and shapes to make a design and discover the result when I cut the first slice is always a surprise. 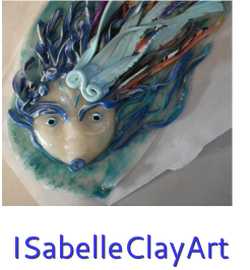 I make a transition from Tchoupuce, and use my own name for my Unique Art Creations so is born ISabelleClayArt. Mixing the 2 new techniques "clay Painting" and "Canes" to create new Art is now my challenge. I like making clocks. They are useful, fun to create, and give you a lot of imagination, shapes and possibilities. I'm part of a Facebook Group called "52 Weeks of Canes". Still creating canes and Clocks mostly. I'm supporting Beads of Courage.org, making beads for them. I am more and more involved in different Association always using polymer clay creations either to give away or raise money to give and support. It feels good to help where I can, and do it in a way I enjoy. Playing with clay! I'm trying to apply to Gallery, often it's a juried process. It's a slow challenge to create more Art pieces. Our FB group "52 weeks of canes" is still on for this year, so I'm still making canes with the group. And I made 3 tutorials for it already. Closing my little handmade Business. Thank you all for your support. Each piece is unique and entirely handmade by me, with Premo or Fimo Polymer Clay. Je suis contente de partager avec vous mes creations. Je suis maman au foyer habitant dans la region de San francisco, Californie. Chaque piece est unique, et entierement faite a la main par moi meme, avec de la Pate Polymer.